In autumn in northern climates, we create our checklist of all the lawn and garden chores we have to complete before winter sets in. 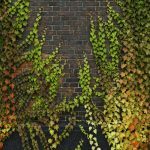 This list usually involves cutting back certain shrubs and perennials, dividing some perennials, covering tender plants, applying fall fertilizer to the lawn, raking leaves and cleaning garden debris. No doubt there is plenty to do in the garden in autumn, but you should add one more chore to the list: fall planting. Continue reading to learn more about fall planting in zone 5. It is early November in Wisconsin, where I live on the verge of zone 4b and 5a, and I am all set today to plant my spring bulbs. Having just moved into this home, I can’t imagine spring without my beloved daffodils, tulips, hyacinthsand crocus. I look forward to them all winter and those first crocus flowers popping out of the snow in March cure the depression that can come from a long, cold, Wisconsin winter. Planting in November may seem crazy to some, but I have planted spring bulbs in December with great success, though I usually do it in late October-early November. 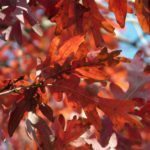 Fall is an excellent time for planting trees, shrubs and perennials in zone 5. It is also a good time to plant fruit producing plants, like fruit trees, raspberries, blueberriesand grapes. Most trees, shrubs and perennials can establish their roots in soil temperatures down to 45 degrees F. (7 C.), although 55-65 degrees F. (12-18 C.) is ideal. 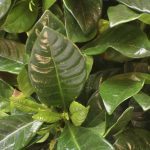 Many times plants establish better in fall because they do not have to deal with sweltering heat shortly after being planted. 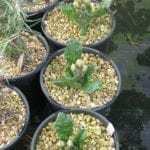 The exception to this rule, though, is evergreens, which establish best in soil temperatures no less than 65 degrees F. Evergreens should not be planted any later than October 1 in northern climates. Not only do their roots stop growing in cool soil temperatures, but they need to store up plenty of water in autumn to prevent winter burn. Another benefit to fall planting in zone 5 is that most garden centers run sales to get rid of old inventory and make room for new shipments of plants in spring. Usually, in autumn, you can get a great deal on that perfect shade tree you’ve had your eye on. You can also extend this fall planting season with the use of cold frames. After the first hard frost, don’t forget to also harvest any rose hips that have formed on your rose bushes. 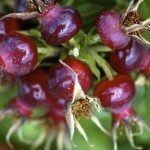 Rose hips are high in vitamin C and can be made into a helpful tea for winter colds. Fall is also a good time to start planning out next spring’s garden. 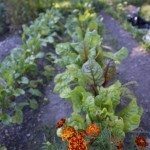 Years ago, I read a great garden tip for making a small new garden bed in snow prone climates. Before snow falls, layout a vinyl tablecloth where you want a new garden bed, weigh it down with bricks or pin it with landscape staples. The vinyl and cloth combined with heavy snow, lack of sunlight, and lack of water and oxygen cause the grass beneath the tablecloth to die. Remove the tablecloth in early to mid-May, when all danger of frost has passed, and simply till the area as needed. It will till much easier then it would as a mass of living turf grasses. Of course, you can also do this on a larger scale with black plastic sheeting. You can have some fun creating round, oval, square or rectangle garden or flower beds with vinyl tablecloths, and most of us have extra tablecloths after Halloween and Thanksgiving.